Google is fixing its latest Android update. *Then* it's fixing its lawn. 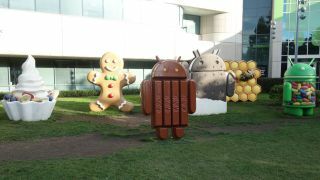 The Google Play versions of the Samsung Galaxy S4 and HTC One are again demonstrating that stock Android phones have certain perks as they have just been upgraded to Android 4.4.2. Granted, this is a minor update to Google's mobile operating system with the release notes indicating it's a security patch full of bug fixes, as was the case with 4.4.1 a few days before. When it was released December 5 for the Nexus 5, Android 4.4.1 brought a number of camera fixes, adding auto focus, white balance and HDR+ to the previously mediocre camera software. But that really doesn't matter to Galaxy S4 and HTC One owners. For them, today's Android 4.4.2 updated is all about fixing more glitches. Android 4.4.2 may do little than bring the bug spray, but it's garnered attention as it carries the controversial removal of the "App Ops" interface in settings. Introduced in Android 4.3, App Ops allowed users to restrict apps from accessing their location and reading and modifying their contacts. Users were able to handily configure these settings on an app-by-app basis, but Google said App Ops was "released by accident," according to the disappointed privacy hawks at the Electronic Frontier Foundation. Still, it's a good feeling to get an over-the-air Android update on time versus waiting for one on a carrier-bought handset. Those phone owners are typically left twiddling their thumbs until wireless providers give the update OK.
Read: Samsung may reveal its first 2K ultra HD phone at MWC in February.